Dubbed “America’s Funniest Cowgirl”, Karen has been blazing a trail since 1998 with her one-woman Cowgirl Tricks comedy show. 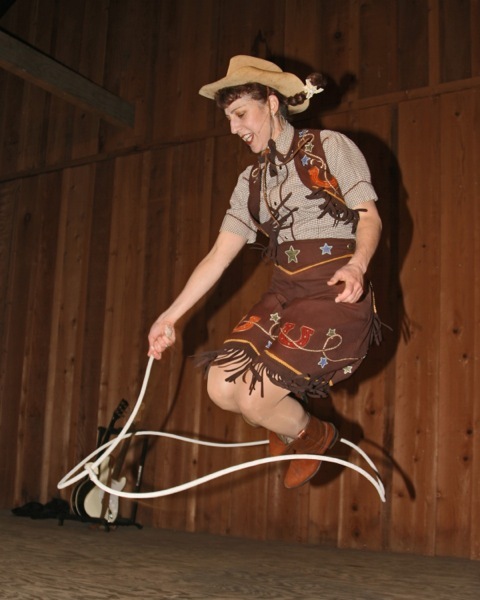 Skillful trick roping, whip cracking and improvisational kooky cowgirl shenanigans have proven popular at fairs and festivals, corporate and private events, libraries and retirement homes, parks, parking lots and assorted domestic and international venues. Ms. Quest is the recipient of many accolades from the Wild West Arts Club International Conventions, including the Comedy Award, Women’s Big Loop Winner and Most Unusual Rope Trick (with Fred Schneider), as well as several ping pong trophies, and many attendance awards from her younger days. This San Francisco-based performer entered a photo contest sponsored by the Pendleton Woolen Mills, and won with this image by photographer Ron Arcaroli, self-titled, “Flying Pigtails”. A 13 year college plan, odd jobs too numerous to mention (well, if you insist: singing and dancing cookie for Van De Kamp’s, and Olive Oyl in a big rubber head for the Popeye Circus with the directors of the L.A. Circus), have made for an unpredictable and interesting, if peripatetic career. An alumna of the Pickle Family Circus, Make*A*Circus, Ringling Bros. and Barnum and Bailey Clown College and the Gong Show, Miss Quest is so much more than a cowgirl; she has created an array of original comedy characters and loves teaching circus, theater and western skills.